By Victor Neufeld, former Executive Producer of 20/20 and the recipient of 22 Emmy awards: “It is a beautifully constructed documentary film, tells the stories of two distinct women and how their lives and creative forces have intersected in the compelling world of Argentine Tango. Julia Juliati is the film maker and she is one of the women who’s dance life and persona are explored. Mayte Vicens is her Tango teacher, who introduces her to the joys of Argentine Tango, both emotional and physical, in this entrancing dance of a film. 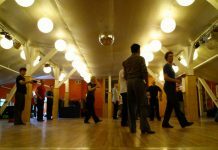 As told through interviews with our two lead players, Julia wants to dive intensely into the process of learning tango. She is fascinated and intrigued by the potential, and discovers Mayte, her teacher. Mayte is a passionate and dramatic guide for her into the complexities of this dance. The construction is uniquely wonderful, as the two women are profiled both separately and together, their dance ambitions as student and teacher are woven brilliantly like a cinematic quilt. 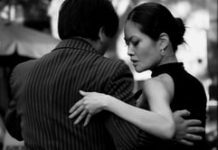 Because we hear about both the emotional components of the Tango lead and follow (the male, female layers), as well as the actual teaching of the Tango moves and steps, the film is deeply layered and very rich. Watching and listening to our two women as student and teacher, we learn about their personal approaches to Tango, their own stories that brought them here, and the development of their close friendship through the dance. We see Mayte in action, teaching Julia and other students as well. We also see Julia’s dance performance that is extraordinary in its sensuality and skills.